Halloumi is a fabulous cheese from Cyprus and a favorite in Greek cooking. It's similar to mozzarella in texture, but since it is brined it's a bit salty and has a greater depth of flavor. It's an ideal grilling cheese because it doesn't melt, although it does soften nicely. It lends itself well to all types of cooking, retaining most of its shape. Frying halloumi creates a unique treat. It's chewy—don't expect it to melt in your mouth—and it's delicious. You can complement it in any number of ways. This dish calls for a tomato garnish and a balsamic vinaigrette, but you can simply serve it ​with olive oil for more of a pure taste. Dry the halloumi cheese slices by blotting them with a paper towel. Place the slices on a plate and brush both sides lightly with the olive oil to coat each thoroughly. Sear the cheese in the hot pan until each slice develops a deep brown crust, about 1 minute on the first side and 1 to 2 minutes on the other. Place the fried cheese on a plate and garnish with the pepper, herbs, tomatoes, and vinaigrette. The halloumi will smoke as you cook it. Don't be alarmed—you're not doing anything wrong. Just turn on the vent, open a window, or run a fan. The cheese should soften as it cooks, but no liquid should escape and it won't melt. You can poke it with your spatula to test its consistency. Beware of refrigerating the cooked halloumi for use on another day; refrigeration tends to make fried halloumi too hard and firm. You can add 1/2 teaspoon of oil to the pan as it's heating for more of an olive oil taste. If you want to skip the tomatoes, simply sprinkle the cooked halloumi with the pepper, the oregano or mint, and perhaps a little more olive oil. You can also try red pepper, paprika, or lemon juice. 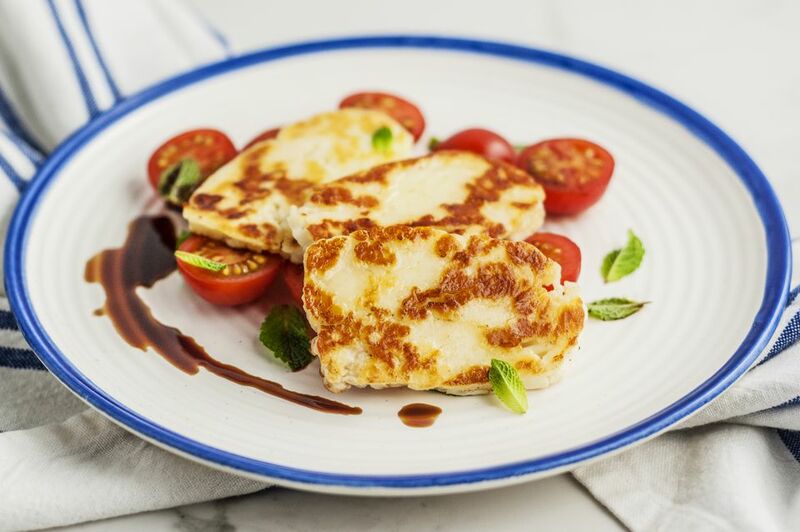 Cubing the halloumi rather than slicing it offers endless options; for example, drop the pieces into a salad or vegetable dish for an added kick.